For several weeks now, I’ve been hearing a short sweet whistle from the treetops, but have been unable to identify (or even locate) the bird responsible for the sound. Usually the call comes just once or twice, then stops. The sound is high-pitched, like a titmouse call, but sweeter and inflected slightly in the middle. 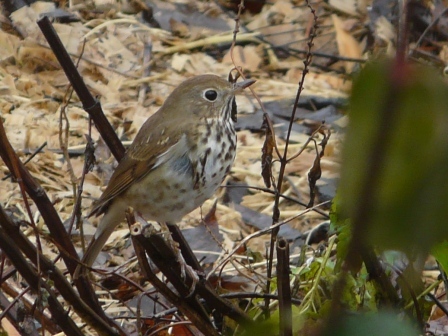 I had just about given up and dismissed the sound as an unusual titmouse, when a hermit thrush landed close to me in a small tree in the garden, cracked its beak slightly, and made the sound. I’ve poked around on the web and cannot find any good recordings of this particular sound, although there are plenty of songs and calls from this species out there. The closest is the waay call on Lang Elliott’s site, but the sound I heard here is not nearly so nasal. This morning, the thrush landed close enough to get a decent photo. Subtle beauty, but beauty nonetheless. I love the thin eyering. This entry was posted in Archosaurs, Bioacoustic revelry on December 17, 2011 by David George Haskell.